Apple today shared its 2018 environmental report [PDF], outlining all of the improvements and changes that were implemented throughout 2017 and early 2018 to lessen the company’s overall environmental impact. As was announced earlier this month, Apple recently hit a major milestone and longtime environmental goal, with 100 percent of its operations around the world powered by renewable energy. Apple has also convinced 23 of its suppliers to commit to using 100 percent renewable energy so far. These efforts allowed Apple to cut down on its total carbon footprint in 2017. During the year, Apple was responsible for 27.5 million metric tons of greenhouse gases, down from 29.5 million metric tons in 2016. 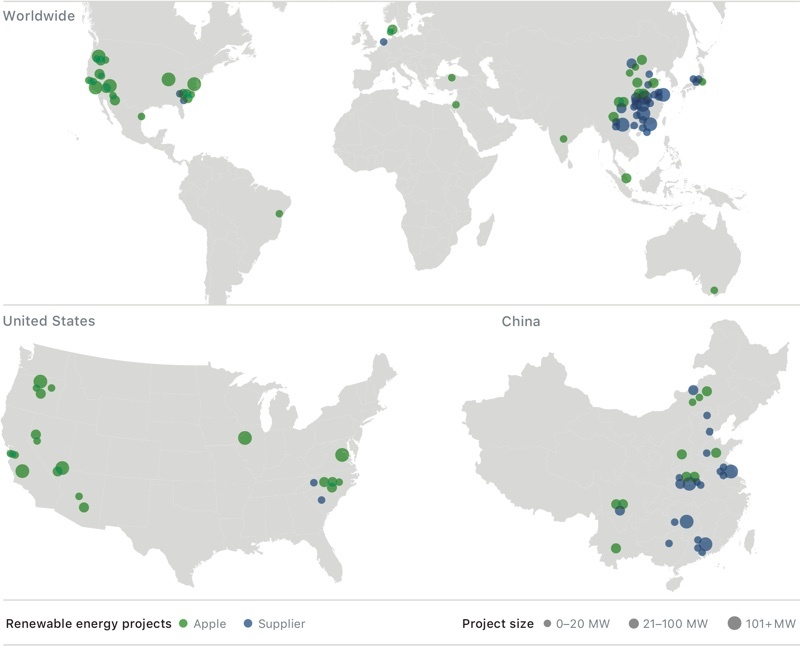 Through its unwavering commitment to renewable energy, improvements to energy efficiency, and a reduction in emissions from aluminum manufacturing, Apple has reduced emissions by 54 percent worldwide since 2011, and as of 2018, 66 percent of the renewable energy Apple procures comes from Apple’s own projects. Over the course of 2017, Apple worked to implement energy efficiency improvements to its facilities around the world, including Apple retail stores. Upgrades were made to LED lighting, heating, ventilation, and air-conditioning systems, resulting in an overall electricity savings of 3.7 million kilowatt-hours per year. 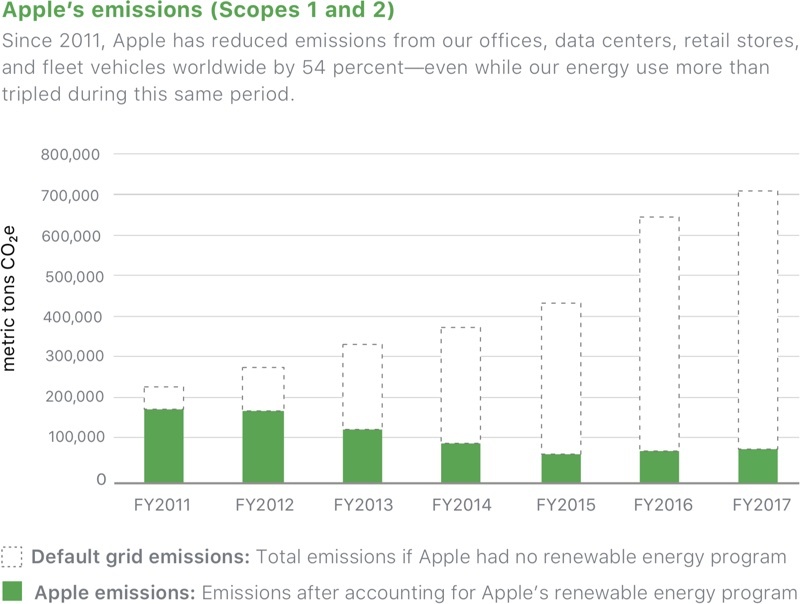 Apple’s overall energy footprint was reduced by 14.7 million kWh and 225,000 therms in fiscal 2017, and combined with other efficiency measures implemented since 2011, Apple cumulatively saves 70 million kWh of electricity and 2.4 million therms of natural gas per year. The company has also worked directly with its suppliers to audit facilities and find opportunities for better energy efficiency, with the program saving an annualized 320,000 metric tons of C02e from entering the atmosphere in 2017. Today’s environmental report highlights Apple’s newest recycling robot, Daisy. Daisy can disassemble 200 iPhones per hour, removing and sorting components more efficiently than Apple’s previous recycling robot, Liam. 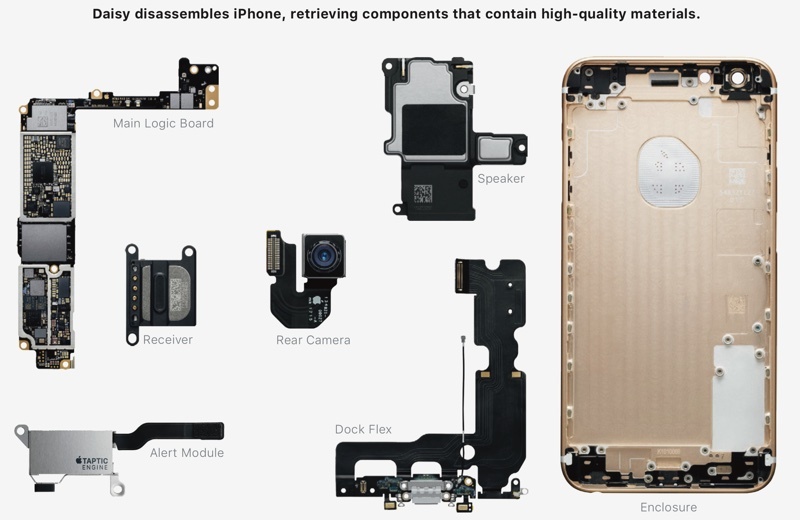 Daisy removes and sorts components from the iPhone, allowing Apple to collect more materials than it would get from traditional recycling methods. Daisy has a smaller footprint than Liam and can disassemble multiple models of iPhone with higher variation compared to the earlier robot. Using Daisy, Apple was able to make progress towards its goal of creating products without mining materials from the earth, aka the closed loop supply chain that it announced as a goal in 2017. Apple says that in 2017, it invited “key stakeholders” to small “closed-door roundtables” in Europe, the U.S., and China to get targeted feedback on its closed-loop supply chain ambitions. Apple spoke with academics, NGOs, industry leaders, and other companies. The company has also been investing in research to figure out the barriers to implementing a closed-loop system, and it has been launching pilot programs to determine possible solutions. Apple outlines several materials and programs it’s currently focusing on, including aluminum (sourced from old iPhones), cobalt (battery scrap is now shipped to a recycler), copper (reducing copper usage on PCBs), glass (new reuse and reprocess methods), paper (sustainable forests), plastics (aiming to eliminate plastics), rare earth elements (exploring new recycling technologies), steel (increasing recycled content), and tungsten (recovered from the Taptic Engine and sent to specialty recycler). Apple’s main accomplishment in 2017 was the use of 100 percent recycled tin for the solder on the main logic board in the iPhone 6s. Recycled tin is now being used for the iPhone 7, iPhone 7 Plus, iPhone 8, and iPhone 8 Plus. For those interested, Apple’s full environmental report [PDF] goes into much greater detail on landfill usage, water usage, dangerous materials, recycling, product efficiency, and more, and it’s well worth reading if you want to brush up on Apple’s environmental protection efforts. Is Fact Check for Yoast SEO a joke?